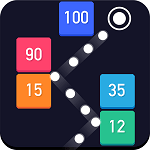 Throw a lot of balls in the game Super Balls and try to hit them with the maximum number of cubes with numbers. Try to choose the most effective trajectory of the ball flight in order to hit maximum targets in one volley. The goal of the game is to destroy all the cubes.